During one of my latest vSphere projects I came across a strange error message. 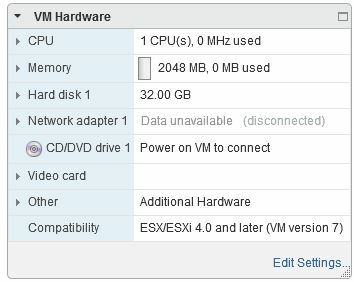 In a brand new vSphere 5.5 environment I added a existing VM from a datastore, which was also connected to the old vSphere 4.1 environment. Previously the VM for sure got shutdown from the old environment. When I tried to storage vmotion the VM I got every time the error ‘Invalid configuration for device 12’. This error was showing up after the svmotion task was nearly finished. After looking around for a while I noticed that the VM was showing ‘Data unavailable’ for the network adapter instead of the mapped port group, which you can see on the screenshot on the right. So what happened here? Within the old vSphere environment the VM was connected to a port group of a Cisco Nexus 1000v switch, which the new environment could not handle for sure. The resolution was quite simple by a) just corrected the port group binding prior the storage vmotion task or b) already move the VM away from the Cisco 1000v port group within the old environment.